Andriod ADB Device Not Showing Up In Ubuntu? Will display info on row_count, auto_increment value, etc. Handy. Without the --default-character-set "Ålandsbanken" will look like "�landsbanken"
Chrome asks permission every time i open a link. WTF? What I didn't bring and learned I needed. We had a very wet & cold overnight hike at bear Mountain this weekend. Being my first event of this type I was a little under prepared. Thankfully Antonio and Brownie had enough foresight to bring the following. A folding bow saw. This was truly indispensable for cutting green wood. Even the dead stuff was soaked pretty good. Sleeping pad. The bottom of the tent was freezing & damp, I think a water resistant sleeping pad would have made a huge difference. A synthetic rather than down sleeping bag would have been a much wiser choice when you know the rain is coming. Synthetic keeps you warm when wet, down although lighter is useless when soaked. Fire starter. Cotton balls covered in Vasoline is a great homemade solution - thanks Antonio. A tarp. Having a communal shelter over the fire made a huge difference. 4 people hanging out in a 2.5 person tent for 5 hours would have been brutal if not impossible. A little more water. I ran out on the hike back, my 3 liters should have been 4. Gloves. Cold & rain is tough on the digits. Waterproof matches for obvious reasons. A few pictures from my phone. I need to bring a proper camera next hike, maybe flip video too. 2. Execute the following git commands on the repo sending the email notification. Note: some of these config settings may be superfluous. $ git config --global user.name "BFI GIT"
3. In the /hooks directory of your bare repository (.git/hooks in a non-bare repo) copy/rename post-receive.sample to post-receive. 5. Edit the description file in your repo (.git/description in a non-bare repo) and replace the text with the name of your project. The text in the description file will show up in the subject line of the commit email. This is a test. Edit: it works. I recently picked up a new iPod Nano and needed to get music off my old iPod onto the new device. Unfortunately I also recently had a hard drive crash on the laptop that held my iTunes library. Here are the steps I used to pull music off my old iPod onto my new laptop and ultimately onto my new Nano. In iTunes, select your iPod from the left hand menu "Devices > Your iPod". Under "Options" check the box "Enable disk use"
Navigate to "Your iPod > iPod Control"
Copy the Music folder to your drive. Let it finish. In iTunes select "File > Add to Library"
Music from your iPod should now be copied to your library. When it's finished you can plug in a different iPod and sync your music. This tutorial assumes you followed my steps in Creating a (free) Linux EC2 Instance. If you're doing this on a 32-bit instance step 8 will be slightly different. Expect to see some "No definition" errors. 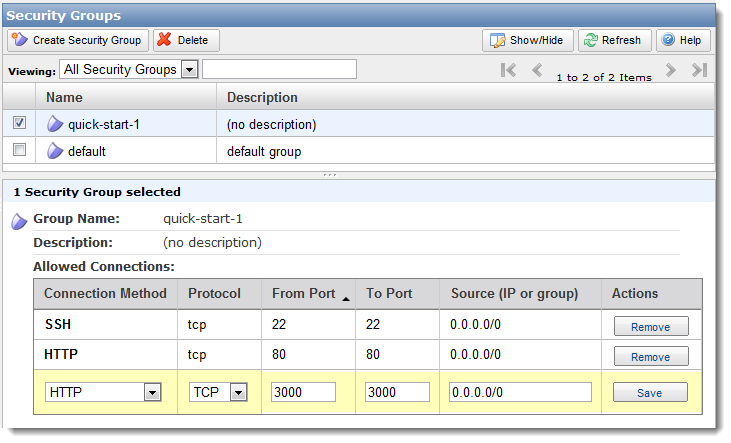 To keep things simple I'm opening port 3000 which is the default WEBrick binding. Login to the AWS Management Console and select the security group for your instance. Add a new entry with the following values. 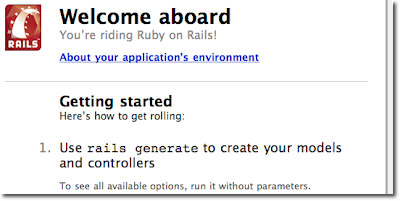 The remaining steps are taken from the Getting Started with Rails tutorial. I'm only using the first few steps here to verify Rails and MySQL are configured and running correctly. Note: WEBrick should really only be used for development & testing. For a production level web server you'll want something like Mongrel. Browse to http://50.16.195.2:3000/ (using your Elastic Ip). If everything worked you will be greeted with the welcome aboard page. You should be all set. If you're new to Rails I recommend continuing the Getting Started with Rails tutorial, to keep going with it start at 4.2 Say “Hello”, Rails.